Some of the best tasting cantaloupes around! They have a juicy, sweet, orange flesh that makes you wish you'd bought more than one. Perfect for your summer cookouts and fruit salads! Just give us some basil, a tomato from the vine, some good olive oil, a little salt, and fresh mozzarella. This variety is perfect for pesto, too. We plant cabbage in Spring and Fall - the Stonehead cabbage is a very firm, tight cabbage head. They average around 4-6 pounds, and this sweet cabbage is the perfect addition to your slaw, sauerkraut, and in any other dish you can dream up! Red cabbage is the perfect side to any dinner, whether cooked or raw. Also an extremely popular addition for your juicing purposes. Like our other cold weather vegetables, we plant broccoli twice a year - in the spring and fall. Packman broccoli yields beautiful, tightly packed heads and florets. Get it while we have it, because it's one of our best sellers! Beautiful, perfect white heads of cauliflower that are perfect for steaming, baking, in a soup and raw with your favorite dip. We plant two patches - one in the spring and the other in the fall. A hybrid variety that yields crisp, cool 8" cucumbers. Perfect on your summer salad or sandwich - or just alone with a little pepper! 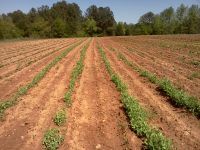 We plant multiple varieties of crowder peas - from the big, perfect Carolina Classic, to the smaller (equally tasty) Top Crop. Both are perfect, high protein additions to your dinner, and delicious when served over rice! Beautiful, sweet peppers that can be eaten green, or once they turn red. They're delicious if eaten raw, or in your favorite stir fry. Medium to large size main season tomato with very good tomato flavor and excellent and uniform quality. Good for all uses. Sweet, robust, round tomatoes. Color is almost black but the flavor is dynamic - much like an heirloom tomato. Grown since the late 1800s, "Yellow Pear" is still popular for its tender, mild flavored, pear-shaped fruits. Low in acid, it has a sweet lingering flavor. Delicious in salads or pickled. This winter squash is similar to others - it has an orange flesh, which has a sweet, nutty texture. It can be cooked the same way - baked, boiled, sauteed, and steamed. A common and delicious way to prepare is to stuff with peppers and meat and serve as an entree. This rich, nutty, sweet squash is delicious grilled, toasted, roasted, and pureed. Butternut squash make a delicious soup, bread, and just eaten plain on the side. This is the perfect low-carb alternative to pasta! This can be baked, steamed, boiled, and even microwaved. Once it's done, the pretty yellow flesh will fall away in ribbons - that look like spaghetti!